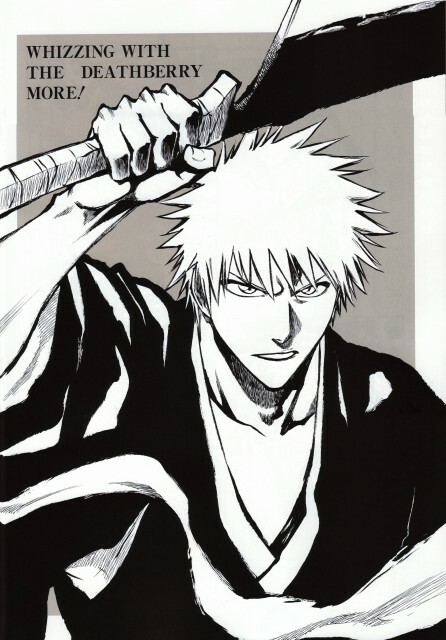 Bleach: Bleach ~ Whizzing With The Deathberry More! Minitokyo »	Bleach Scans » Bleach: Bleach ~ Whizzing With The Deathberry More! Scanned from the All Colour But The Black artbook. I have no idea what that means, but I like it... it's so bizarre! Not that it matches this raw image of Ichigo as he psyches himself up for yet another fight. Thank you for sharing image is very good. Oh, threatening Ichigo! Black and white colors are amazing here. Thanx for sharing! Umm, we're gonna take a potty break with Ichigo?